The participants of the Novo mesto, Slovenia & Karlovac, Croatia eCollaboration Gathering will investigate opportunities in an accelerated cross-border eCollaboration with a particular interest in preparations for the European Year of Cultural Heritage 2018. Current activities – short oral presentations by the participants. Areas of joint eCollaboration interest. Preparations for the European Year of Cultural Heritage 2018. Possible joint actions in 2018. Invitation to the organizations in Karlovac County to join the Inter-Municipality Initiative: Cross-border eCollaboration in the eRegion, http://eregion.eu/countries/croatia. What can we jointly prepare for Cross-border Cultural Heritage & Tourism ePromotion in 2018? Što možemo zajednički poduzeti za prekograničnu e-promociju kulturnog nasleđja i turizma u 2018 godini? Kaj lahko skupaj pripravimo za čezmejno e-promocijo kulturne dediščine in turizma v letu 2018? Tourism – joint promotional activities of the Karlovac Tourist Board, Tourist Board from Novo mesto and their destinations around the River Kupa. The development of the mobile application within the project Green Heart of Croatia, as well as mutual border encounters hosted by the municipality of Drašići in Slovenia should make the whole region more attractive for visitors. 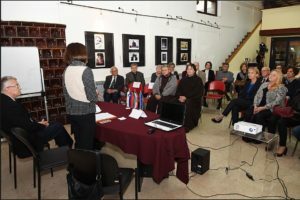 Representatives of libraries and archives have invited two tourist communities to present their institutions as attractive tourist destinations that can represent the great cultural wealth they have. An example of good co-operation is the manifestation called Trdina’s literary visit to Sveta Gera (Trdinov vrh), a combination of hiking and reading of the literary texts of Janez Trdina. The museum collection of the Franciscan monastery in Karlovac and the library of the Franciscan monastery in Novo mesto should be made more available to interested citizens and tourists. As both monasteries are located in the center of the city, it would be necessary to concretize cooperation with tourist communities so that the monastery collections would become part of the usual tourist offer. It was suggested to organize a Christmas concert in December, in Karlovac and Novo mesto, on which students of music schools and high schools of both cities would participate. Gimnazija Karlovac will host students and teachers from Gimnazija Novo mesto in November 2017, as to agree on joint research, musical and cultural co-operation. High school students from Novo mesto will be hosted by Gimnazija Karlovac in the Museum Night, in January 2018, during which they will organize one workshop. 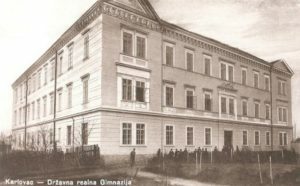 Pharmaceutical company “Krka” d.d. Novo mesto is a long-term sponsor of the so-called Krka Awards, a prize given for achievements in medicine, veterinary medicine, pharmacology and science. 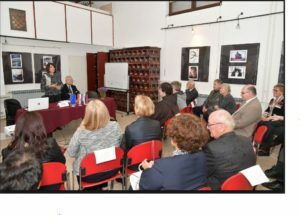 The renowned representatives from the Krka company have informed about the possibility of rewarding successful scholars and practitioners of the mentioned scientific areas from Karlovac county. Inter-Municipality Initiative Cross-border eCollaboration in the Danube eRegion 2019 Powered by SRC d.o.o.